I am always SO inspired by the pretty food pictures and delicious sounding recipes on Pinterest. But let’s be real…they NEVER really turn out as pretty as the picture, RIGHT?! I do believe it WAS! Directions: Preheat oven to 400°. Drizzle the bottom of a glass pan with a little olive oil. Saute onions and garlic in a little olive oil for 3-4 minutes. 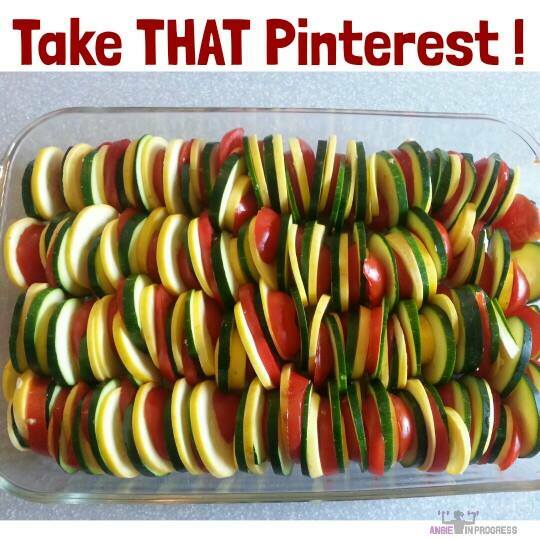 Meanwhile, slice up all of the veggies! I used a knife, I didn’t want them to be paper thin (using a mandolin would be ok…but just don’t use the thinnest setting). Place the slices int the pan in an alternating pattern. Sprinkle the top with sea salt, pepper and the fresh basil. Cover with foil and cook for 30 minutes. Take out, remove foil and sprinkle on a little freshly grated parmesan cheese! Take a picture of YOUR masterpiece and share it with me HERE! Like this recipe? Want MORE?! Join me on Monday, August 18 for my FREE 7 Day Slim Down group on Facebook! Past groups have lost an average of 5-7 pounds…in one week! You won’t be starving either! We’re eating 5-6 meals/day of good, clean foods! DEADLINE TO SIGN UP Friday August 15th! Previous PostPrevious FREE 7-Day Slim Down!